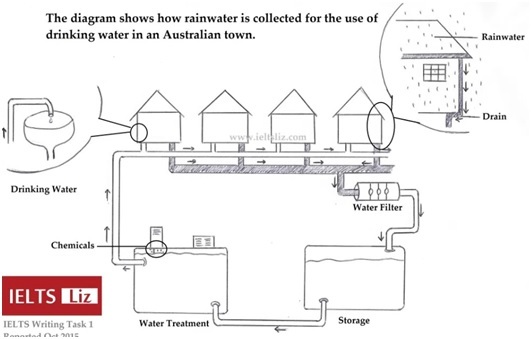 The following diagram shows how rainwater is collected for the use of drinking water in an Australian town. This task is taken from the IELTS Liz website. The given diagram depicts the various processes involved in obtaining clean drinking water from rainwater. Overall, it can be seen that the process has five main stages which starts with the collection of impure water from homes and ends with the distribution of purified water to the same homes. The process starts with the collecting of rainwater from rooftops using drains. All households in the locality are fitted with such drains. The water thus collected from all homes is then made to pass through the water filter. The filter removes most of the impurities. The filtered water is then collected in a large storage tank. The water in the storage tank is then directed to the water treatment tank via a pipe. In the water treatment tank, the filtered water is treated with chemicals to make it fit for drinking. The potable water is then sent to households via pipelines and is made available for domestic use.